Sadly, binge watching television shows has become the pastime where binge reading once was. However, this is an interesting portrayal of information. 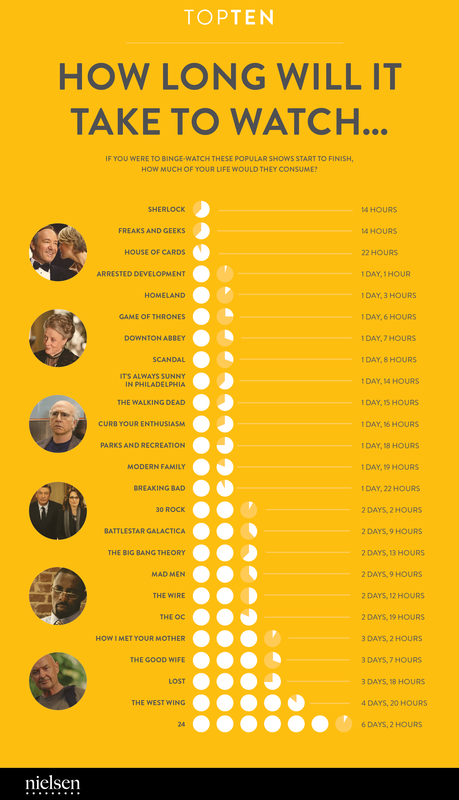 Beginning with Sherlock and going down to 24, this infographic shares how long it would take to watch a series of popular tv shows without a break (although hopefully in that time you do eat and shower). But it does give a simple portrayal of time. Each circle stands for a day, each shaded portion stands for that portion of a day. So two fully shaded circles and one half shaded circle signifies two and a half days. How else can this time frame be used: the amount of time people of different ages use the internet, use their cell phones, and for what? How else could this shaded portrayal be used? As people, or as other objects significant to the infographic?